I picked up this combination in a bar in San Sebastian in the Basque region of Spain. Famed for the best food in Spain the city boasts hundreds of bars each offering their own specialities, their bar counters groaning under the weight of huge platters of bite-sized pinchos. 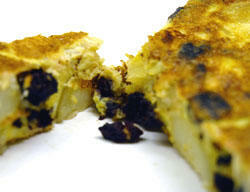 This was a subtle play on traditional tortilla with the addition of blood sausage or morcilla. I used a smoked version here that I bought from a Portuguese deli. Peel, chop and shallow fry some firm waxy potatoes in olive oil. Fry them at a relatively low temperature so as not to colour them. Whilst they cook, chop an onion, I like to chop thin rings, and soften them in a pan. Add a generous handful of the chopped blood sausage and let it crumble slightly. Beat 6 eggs. Once the potatoes are cooked, mix everything together, throw in a healthy couple of pinches of sea salt and pepper and then put the whole mixture in a heavy bottomed pan over a low-ish heat and cover. I usually finish mine off under the grill and turn it out on to a plate.